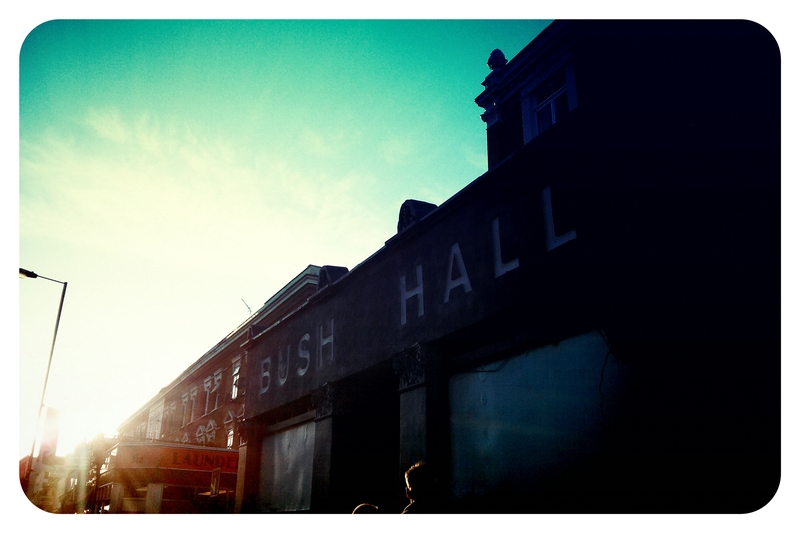 Friday night found me and two of my favourite people trudging along the Uxbridge Road in the Bush of the Shepherds (as Adam Buxton called it) to see some comedy at Bush Hall. I’ve already seen a bit of comedy this year – two shows at the Union Chapel in London put on by the Invisible Dot, and the recording of a Radio 4 programme – and this was an extension of what I’ve already seen. Mainly because I was seeing the same comedians again. First up was a new comedian to me, Simon Munnery. He MC-ed the event and set up the evening well, talking about the hazards of conversing with strangers in the country (which made Husband giggle as he experiences the same problems walking to the train station here) and how much love he has for his children, despite them kicking each other in the face. Then, one of the main reasons for our attendance – Adam Riches. This is my fifth time seeing him and he still makes me cry with laughter (and I hate to be a smug hipster, but we originally saw him almost two years ago). I’m always hesitant to describe what he does if people ask, because I do urge everyone to see him and I don’t want to spoil it. To loosely describe, he does character comedy, but it’s like no character comedy I’ve ever seen. What I love about Adam’s act is that he seems to genuinely enjoy what he’s doing which makes me laugh even more. A surprise for me was the appearance of Ed Byrne who hadn’t been announced when I bought tickets. There was a bit of discussion between the three of us as to whether we’d seen him before but looking into it, I don’t think we have. He was of course very funny, but we were starting to get incredibly hot and uncomfortable at this point so I don’t think I enjoyed him as much as I could have done. Finally, Dr Buckles’ laptop was set up and he leapt on stage, with a summer haircut that made him worry that his face looked big. This time, I kept my camera in my bag to avoid any further uncomfortable situations and watched Adam Buxton’s presentations on earache, Atoms for Peace and Zavid Bowie. Some of this I had seen a couple of months ago, but the addition of a Lego film that depicted how Bowie came up with Aladdin Sane made up for it. Although, I have to say I do prefer Bob Cobbler. Next up on my comedy trip of 2013 – Eddie Izzard next weekend. WOO! !